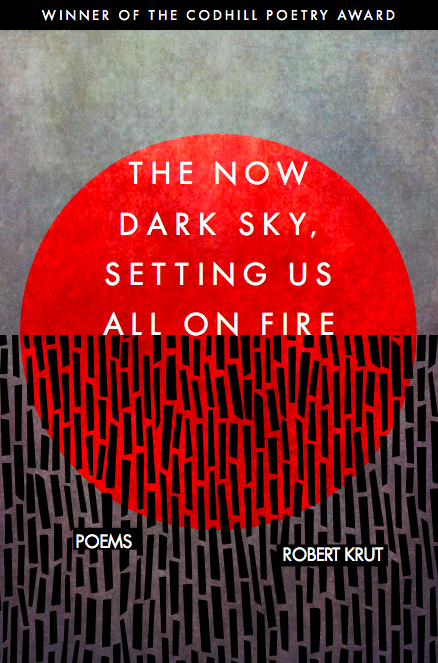 Writing Program lecturer Robert Krut’s newest book, The Now Dark Sky, Setting Us All on Fire, has been awarded the Codhill Poetry Award by the Codhill Press. The award is given to the poet whose work stood out as the best of the year among all submitted poetry. Krut’s newest book is his third collection of poems. His previous works include This is the Ocean, the recipient of the Melissa Lanitis Gregory Poetry Award, and The Spider Sermons. The Now Dark Sky, Setting Us All on Fire’s poems each suggest an alternate universe that helps us to better understand our reality, wrote Bully Love poet Patricia Colleen Murphy in a short description of the book. Inclined to Riot poet KMA Sullivan described the book as a “pendulum swinging from fantasy to physicality and back again.” Each poem includes elements of magic and fantasy, such as a doorman wearing a hat full of beetles or a preacher caught in a lentil rainstorm, but the narrative is clear. “These poems acknowledge our longing for escape but leave us with the unescapable conclusion that we are tethered now and forever to ourselves and to this bloody drenched world,” she wrote. To learn more about the poet Robert Krut, read our “Focus on Faculty” profile here.